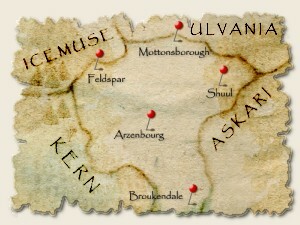 Muelsfell is a relatively small section of a much larger world. Still, it covers a massive area, ranging from arid desert to frost-coated wasteland and all points between. The more hospitable areas of plains, woodland, and hills have been split up into five provinces. Each of these provinces is unique and governed by distinctively different groups of people. In addition to populated and stable provinces, there are notable areas that are wild and untamed, typically infested with all manner of monster. Terrain Plains and fields, light woods and hills. Beyond any shadow of doubt, Dimitra is the most militaristic province of Muelsfell. All provinces have standing armies, but it is the Dimitrian Republican Guard that the average citizen respects -- and in some circles, fears. Some scholars would label Dimitra as an overly oppressive and opportunistic totalitarian state. This may be the case in some ways, but most of its citizens do not suffer and happen to have a good standard of living all things considered. Still, few would say that the Dimitrian armies have not been ruthless on occasion. Nonetheless, military careers are the pre-eminent means to a living in Dimitra. Decades ago, Dimitra lost a significant portion of its then current military force in a poorly executed war against Askari. A new generation of rulers has since taken over reign of the province; younger men and women who do not remember the old war and are hungry to prove themselves. It is currently after noon. The weather is clear.